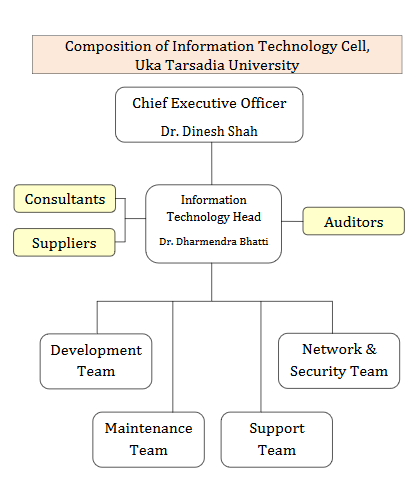 Information Technology Cell is established with objective to support and excel; Uka Tarsadia University's academic and administrative activities using Information Technology. Uka Tarsadia University has developed 50+ applications and hosted on in-campus university servers. Applications are designed keeping in mind the different dynamics of operation, and can be customized according to the needs of the university. The implemented solutions raised transparency, established accountability, eliminates manual work, and increase the efficiency. It is learning management system of Uka Tarsadia University containing modules like syllabus, lecture schedule and entry, assessment plan, entry, import/export, student feedback, online examination and MIS reports related to student, lecture, assessment, feedback. Current convocation form filled related reports and statistics, generate passing certificates, PHD Notification entry and basic configuration, Feedback configuration and basic reports. Student fills convocation form with their existing enrolment number and authenticate with their registered mobile no and email address. after that student can verify and modify their contact information and giving feedback and pay convocation fees online payment gateway and generate fees receipt in their login portal. UTU Convocation application provides facility to view summary of convocation from filled by the student and the status reports whether the students is going to conduct the convocation or not. Online Certificate Request is the online system where University students can request for various certificates like Migration Certificate, Transcript Certificate, Duplicate Degree Certificate, Provisional Degree Certificate, First Attempt Certificate, CGPA to Percentage, Language Certificate. Student have to upload scan copy in image format where asking, student can select delivery option and student have to pay online fees. Once Certificate is ready it will send to student mentioned address in case of Postal delivery or hand to hand receive. Grievance Management System for resolving student grievances. Using this system student can raise the grievances from his/her Account. Student also give the proposed solutions .These grievances view by concern user and processed. Easily get current syllabus file and teaching scheme of every course semester wise. Send Notification to student like Exam notification, Fees notification, Institute notification, University notification. SRIMCA alumni is a linkage between passed students and the campus. Newsletters, job alerts, birthday reminders, etc are sent to alumni members, so as keep them aware of different requirements in market as well as events going in the campus. Alumni members visit institute and share their experience with students. The Placement Cell plays a important role in locating job opportunities for Under Graduates and Post Graduates passing out from the college by keeping in touch with reputed firms and industrial establishments. The Placement Cell operates round the year to facilitate contacts between companies and graduates. The number of students placed through the campus interviews is continuously rising. On invitation, many reputed industries visit the institute to conduct interviews. The Training Cell Plays a important role by providing opportunities for Under Graduates and Post Graduates passing out by give training like Personality Development Program, Communication Skills Program etc. For maintaining and tracking exam assessment task co-ordinately with mobile application that includes packet creation, packet assignment for assessment, acceptance by examiner, submit by examiner with number of supplementary assessed and finally accept by Exam section. Objective of this System is to manage the details of Examination related functions like Syllabus, Common Group management, Managing Board meeting scheduling , Board Creation, Email Appointment to Examiner and other exam related tasks. The purpose of the system is to build an application program to reduce the manual work for managing the Examination Task. Automatic and secure by three-way authentication Question paper generation within minute for selected Examination date or for Single subject Question paper generation. System will generate all pdf files encrypted on downloading the question paper. Responsible for Question Bank Entry for particular subject and syllabus, Subject expert is responsible for submitting the Questions. Once question submitted, moderation process is done by moderator. Online examination system is a web-based examination system where examinations are given online. either through the internet or intranet using computer system. The main goal of this online examination system is to effectively evaluate the student thoroughly through a totally automated system that not only reduce the required time but also obtain fast and accurate results. Exam control room is used to assign documents to the supervisor for exam conducted by the university and swap answer book if answer book is damage or wrongly given to the student. Manage "continue evaluation " marks and related reporting. Exam watch panel monitors supervision duties assign to university staff and report regarding exams. Phd result entry of the scholar who applied in phd program. Result processing module provide university to calculate result on base of marks entry done, gracing module for give gracing to students with help of three way authentication and provide necessary reports. Theory examination section-wise answer books are identified with barcode system. System helps in generating barcode data and printing it . This Application is used for tracking the student entrance to whole exam process like paper distribution, student late entry, absent student, Student signature and answer book submission. Online Application use for tracking Online form filled and Admission Confirmation data on daily basis. Also facilitate follow-up for non confirmed admission form and maintaining follow-up data for each and every follow-up. Admission statistics data is available to all director for respective course. Admission form filled list and Admission confirmation list is available. Application Responsible for Pre-Enrollment Process based on Form number for University course and adding all details for Centralised Course including Photo and Signature uploading and download fees Challan. After Pre-Enrollment Process Student can Confirm Admission from their account(for University Course) and offline at UTU Office with online fee payment. This application empowers parents to fill up enquiry form from the comfort of their homes and these information is then available centrally in our university ERP from where university staff can reach out to prospective parents and convert these enquiries into admissions. Student apply/register for admission online, select course and pay admission form fees, apply for the provisional admission and pay tuition fees and student get all fees receipts and admission letter in their portal. This application includes functionalities like "Admission Inquiry List", "Inquiry Details view", "Online Payment Log List", "Online Payment Log View", " Basic Configuration". Using this application UTU staff can create new admission inquiry for their relative student from their single sign on login and track inquiry process. Provide necessary data to android application for display record of admission summary. User can view detail about course from anywhere. course detail like duration, intake, Eligibility, Fee structure etc. Display Course wise faculty wise admission summary like Course selected, Enrolment Confirm, cancelled , Transferred, Provisional admission. Crash Course is online application system where any students can register for themselves by paying online fee for available courses. Fees Collection and Management are critical operations for the university. It helps in managing the operation of fees collection and fee receipt generation easily and quickly. Also its automates the fee receipts entries in the university accounts eliminating the need of repeated data entries. This system is a online application system which is useful for student deposit refund. Student apply for deposit refund (give bank detail) then account department check out the apply student list for further process. This system helps in payroll management functionality including salary, tax, PF. This application manages all the detail about employee like profile, education, Publication, seminar, conference etc. It deal with monitoring the information and transaction of Employees. Editing, adding and updating of records is improved which results in proper resource management of employee information system data. It can also manage the employee leave. Online External Agency Document Verification is the online system where Outer company can register for themselves using Email address and request for document verification for Students or Ex Employee by uploading document for verification and desire response format and online payment. Once Document Verification Request process complete at University, response document uploaded against this request. This application manage all employee past and current leave. Each Institute wise authority is manage respective employee leave either accept or reject leave. This application provide department to book hall for program or any event. Each department compulsory upload signature document while booking any hall. In Institute Information system Institute admin can enter the detail about their seminar, conference , curricular , extracurricular activities etc. Using this system can get the utilization of classes and employee. From time table entry we can get detail about class that is how much time the class is used in a day , week and month. From time table entry we can get detail about class that is how much time the class is used in a day, week and month. Online Application where Exam Coordinator from various course can do entry for Programme Outcome, Course objective, Course Outcome and do mapping for Unit-Course Objective, Course Objective and Programme objective mapping. Based on these entry report of Course Attainment and Programme attainment can be generate. This is Centralised application developed for university office to get information about student, alumni, staff on their fingertip. Academic year wise Student admission summary, Student Status and Student Examination and Fees Status. Employee Details like Employee Profile , Current Leave taken Summary. Feature available for uploading Employee document. Attendance management is the act of managing attendance or presence in a work setting to minimize loss due to employee time theft. The current world relies on various methods of attendance management, with the help of biometric devices. Application for taking attendance of those staff who are having duty outside of campus. This is location based attendance application. Attendance viewer is use to check in and out entry time of university staff and also monthly and yearly analysis data can be view. By the use of Institute and Department module colleges can get detail of students list on base of course and semester/Year, provide certificate to students like bonfied certificate etc. This system used manage those students' subjects who have been transfer from another university , taken admission in second year and rejoin students whose equivalence report generated , require to appear in subject which are offer in university which student have not study in past and exempted in the subject in which student have cleared in past. Journal of Pharmacy and Applied Sciences, the official journal of Uka Tarsadia University, started in June-December 2014, previously accepted the manuscripts through email. This system involved manual operation and tracking of articles became troublesome. So there is a need of online manuscript submission system which will reduce manual interference with potential to reduce any misconduct in the publication. Online system will lead to transparency in the system and make it easier to track the progress of manuscript with the help of reminders and alerts. Student / Staff can registration and submit abstract and pay conference fees online and get fee receipt in their portal. Get all statistics about apply all registration data conference wise respective coordinator login. Hostel Attendance System create for taking attendance of all hostel student when they come inside of hostel and going outside of hostel using face reader machine (Biometric). This is system also use for student take leave when they want to go home in holiday leave approve by warden of hostel and SMS send to their parents when student departure from hostel and arrival to hostel . Stock management system which is keep track detail regarding the equipments, and also keep tracking the product location where is the product place. Provide facility of uploading mark sheet, degree certificate, Adharcard etc.. This program is a component of the Additions program. School volunteers work at the schools of their choice and participate in activities that match their interests. This program special attention and caring that can inspire students to reach for and realize their dreams. This application is used to automatically check a student’s progress in their chosen degree program(s). Library Viewer is use to view student, staff visited to the central library every day. Performance Based Appraisal System is provides facility to collect teaching-learning, co-curricular, and research aspect of teachers. The System is responsible for tracking and solving maintenance related complaints in different area of maintenance, at Uka Tarsadia University. It focuses on maintenance complaints of Information Technology, Electrical, Plumbing, Building maintenance, and others. From different department, complaint launched online(by Complaint Generator) and respective officer is responsible to handle the complaint and respond to each and every complaint. Accept Offline fees for admission form and basic admission process for Maliba School student. Set up job based on advertisement(recruitment needs) , promote job listings and easily keep track of submitted applications. Follow every applicant and build a database of profiles with submitted details. Student apply for exit from course and pay fee online. Single sign-on (SSO) is a property of access control of multiple related, yet independent, software systems. This application allows configuration of allowing access to particular application based on role or individual user. University staff and student will have access to applicable applications in their login. University Notification is an API to send notification regarding university notification like fees, exam form etc to students and parents. Mi-Fare card is use to configure card and allow right to student and staff to enter central library. DigiPay is used to pay fees online with the help of multiple payment gateways - PayNimo and Paytm. Daily Work Report : user see their daily work data and filter data user wise and project wise and date wise. Task Create : In this page admin user can create a new task and assign task to multiple task user and set task priority and task deadline date. Task By User : In this page admin user can see their created task list and filer data using from date - to date and task status wise. Task To User : In this page task user can see task assigned to them and user can view particular task details and change that task status and communicate with task user connecting that particular task. Task View : In this page both task user(Task By, Task To) can see task assigned to them and user can view particular task details and change that task status and communicate with task user connecting that particular task.